To be frank with you, it may cost a lot for a hotel room. You get what you pay 😛 The Ice Hotel is really beautiful. If you’re up for something new, why not right? Kakslautten Arctic is similar to the Ice Hotel in Sweden but not really. As we all know, igloos are made out of the snow but, the igloos here are slightly different from those normal igloos. What makes it stand out? 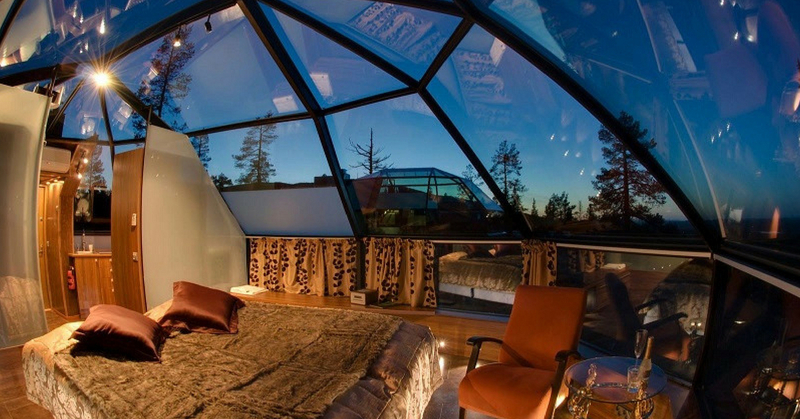 Instead of being covered by snow like those ordinary looking igloos, they changed it to the transparent glass where all the visitors who visit the resort can enjoy and experience the extraordinary view of the resort, especially during the Aurora Borealis season which is April-August. As a kid, we always thought how cool will it be to own a tree house where we can invite our friends over to play a game or just chilling in our own space up on the tree. But you know this kind of idea doesn’t just stay in a kid’s mind as some people took the idea seriously and make tree houses so people can enjoy it too. Just like the free spirits spheres in Canada, people can actually sleep in the spheres that are hanging high up on the tree and enjoy nature at its finest. It looks super fun and cute! Calling all the Disney lovers out there! Do you know that there are actually hotels rooms in Disney hotel that are decorated based on Disney Character? If you don’t, now you know 😉 you’re welcome! Sadly they don’t have a themed room for all the Disney characters. Honestly, these characters themed rooms are good enough tho and we wouldn’t even care. After all, it’s DISNEY! Imagine and experience how it is like to be in Cinderella’s shoes for a day and enjoy the royal treatment. Not to mention, the super beautiful room! New Zealand is not only known as a beautiful country. It is also known as the home of Hobbit as the movie is being shot there. There is a Hobbit Village there so it is not surprising to have a Hobbit-themed motel there too. Which are your favourites, dear readers? Let us know!